NTM(r) Salt is rock salt. Natural rock salt mined from an open pit deposit near Redmond, Utah. While NTM(r) Salt is mostly pure salt, (95% pure sodium chloride), it also contains many valuable trace minerals .... Natural trace minerals that all livestock need: calcium, potassium, magnesium, sulfur, zinc, copper, iodine, iron, phosphorus, and manganese. 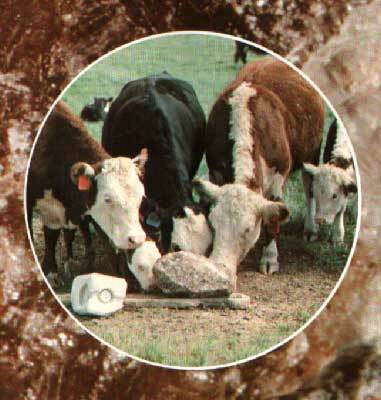 These valuable minerals are all essential to the proper growth and development of your livestock. And, because they are natural, the price of this salt is generally far less than salt with artificially added minerals. Bulk, Bagged or Lump NTM(r) Salt fits nicely into your feeding program whether you are using bulk, bagged or block salt, either plain or mineralized. Handling of the chunks is now very easy with our large, pre weighed super bags. Each bag is its own individual storage container and can be easily moved with a fork lift or front end loader. NTM(r) Salt is also available crushed and screened into four sizes ideal for any operation. All grades are available in bulk, in superbags, in plastic lined paper bags or 50# burlap or poly bags. Other Advantages NTM(r) Salt in lump form offers more advantages over block salt than just minerals and low price. Another factor to consider is weather resistance. Due to its natural formation, chunks of NTM(r) Salt shed rain better than pressed blocks do. 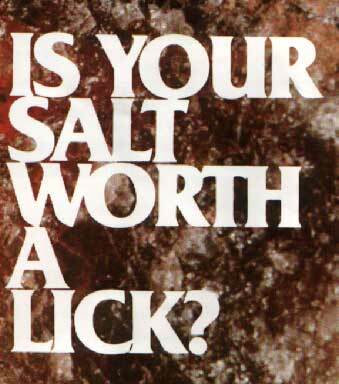 Your livestock get more of the salt they need and you lose less to the weather! Another advantages preference. Try this: Put a lump of rock salt and a pressed salt block of equivalent weight together in a field. Weigh again in 30 days. Most customers report animals prefer NTM(r) Salt. Because livestock prefer the NTM(r) Salt, they get valuable minerals they need, you lose less salt to the weather, and you save money over the cost of artificially mineralized salts. NTM(r) Salt is a natural product, so the analysis may vary slightly. Below is the summary of analyses taken over the past 30 years.